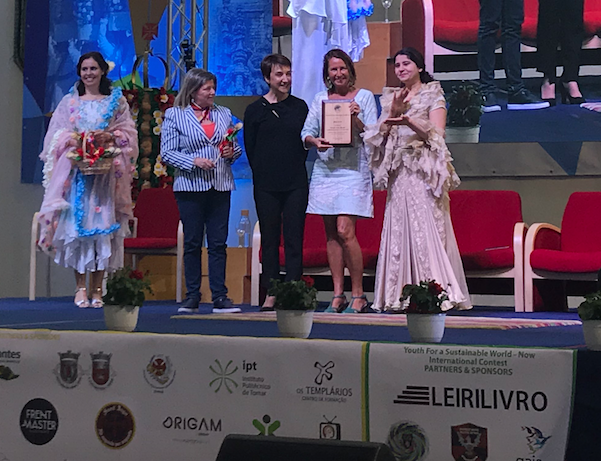 (26 March 2019):- May East, CEO of ECOLISE member organisation Gaia Education, has received the ‘Women of the Decade in Sustainable Change’ award at the Women Economic Forum in Portugal. The award is recognition of her work over three decades to promote the role of women in society in vulnerable regions of the Global South at risk from climate change. She has been particularly active in India and Bangladesh, working with women to develop their leadership skills, provide education and training, establish businesses and support sustainable food production to enable their families and communities to flourish against the backdrop of looming climate change. She has previously addressed the United Nations General Assembly on the challenges facing people affected by climate change and has been instrumental in securing Scottish Government funding to help at risk communities. “I am delighted to receive this award from the Women’s Economic Forum. It is an award I am proud to share with the entire team from Gaia Education who do remarkable work with women around the world. Scotland has been a leading voice in the global sustainability movement and the support of the Scottish Government has also been crucial to the success of our many projects with women,” said May. Originally from São Paulo in Brazil, where she combined her love for music and the natural environment, May East moved to Scotland in the early 1990s and has been a leading figure in the sustainability movement. She helped develop a close relationship between the Findhorn Ecovillage and the United Nations, culminating in the creation of the UK’s first UN linked training and sustainability centre in the village. She was previously named as one of the top 100 Global Sustainability Leaders for her work to promote sustainability and climate change awareness and in 2013 was awarded Special Fellow status from the United Nations Training and Research Institute UNITAR.